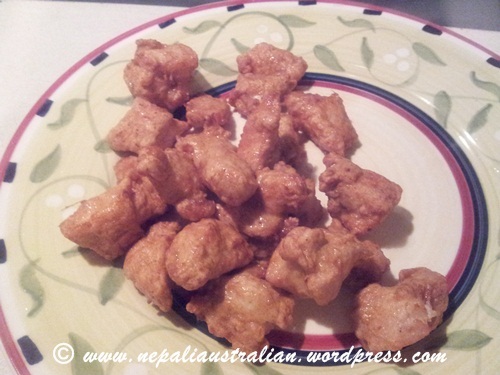 This used to be one of my favourite entrée served in Nepali wedding parties back in the day when I was a kid. I still love them and I learned this from my BIL, my cousin K didi’s husband. 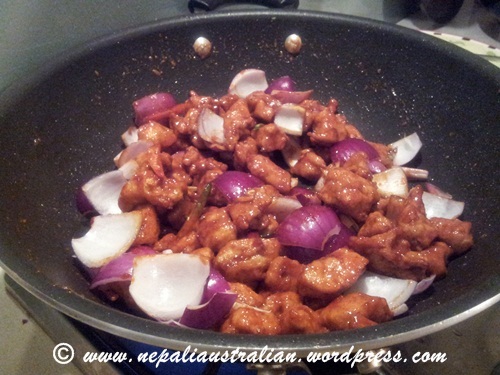 It is simple, quick and yummy. 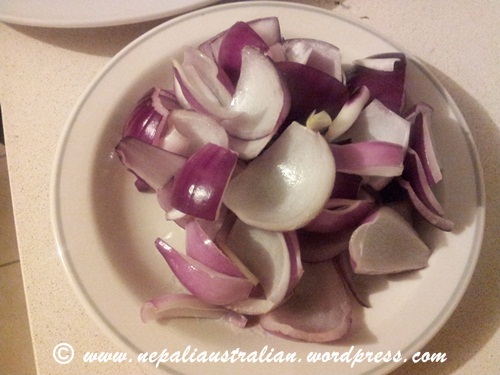 Cut the onion into quarters and take off each skin one by one. 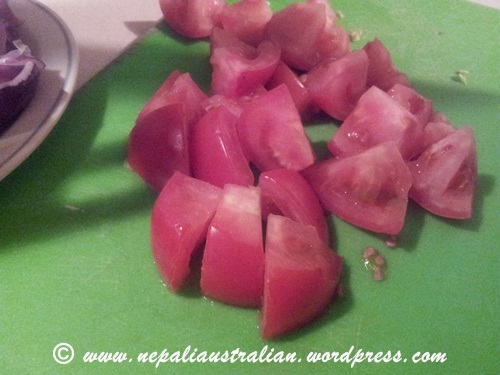 Cut capsicum and tomatoes around 1 inch square in size. 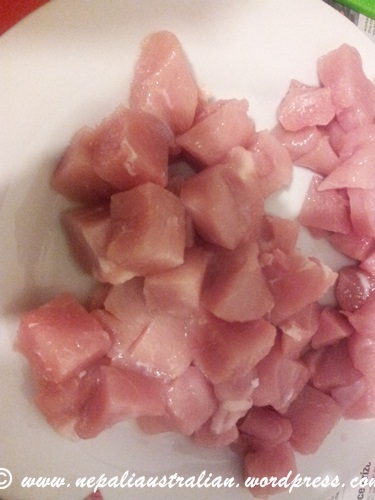 Cut the chicken breast around 1 inch square in size. 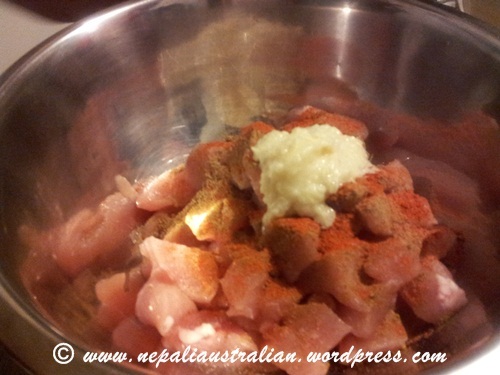 Put chicken breast in a big bowl and mix well with cumin, chilli, turmeric powder, salt and ginger garlic paste. Then add plain flour and egg and mix it. Make sure to coat all the chicken pieces well. 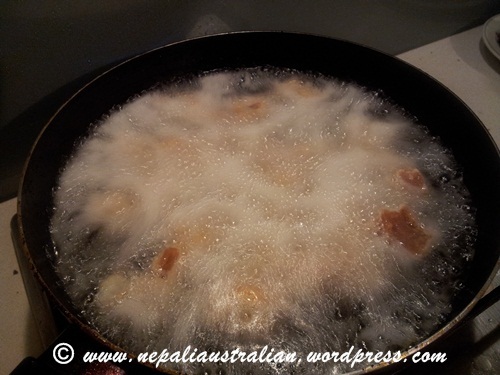 Fry the marinated chicken cubes in the oil. 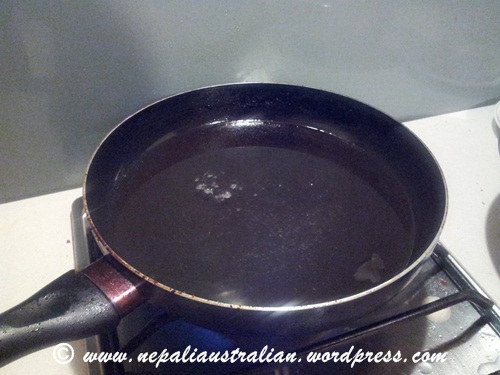 Once it turns golden brown, take it out from the heat and put aside. 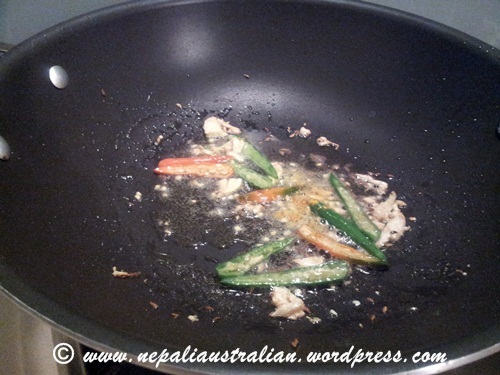 In a wok heat 2 tablespoon of oil and add sliced green chilli, cumin seed, crushed ginger and garlic and fry for about a minute. 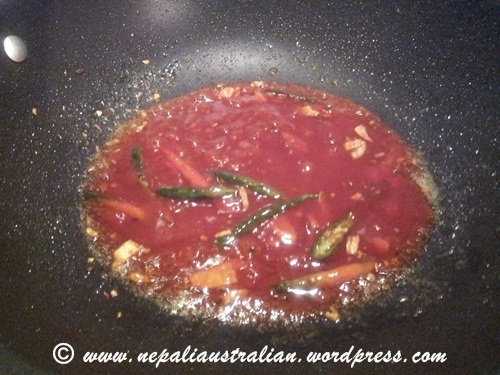 Add tomato ketchup in the wok and let it cook for a few minutes. 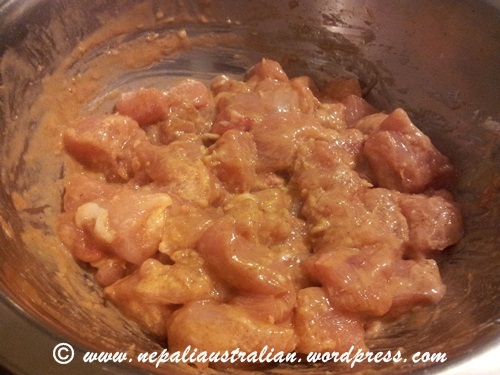 Add fried chicken and mix it well with the sauce. 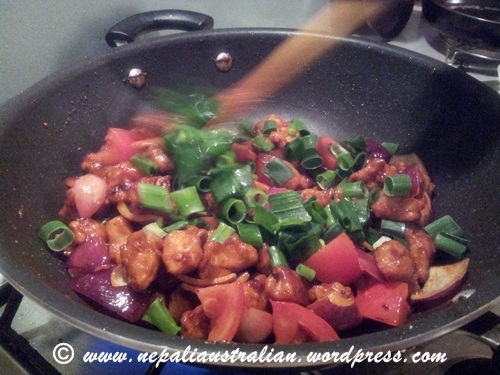 Now add Spanish onion, tomatoes and capsicum. Give it a quick toss we don’t want the onion to cook. Add green shallot and coriander and give it a quick toss and take it off the heat. Serve it as an entrée or with rice. 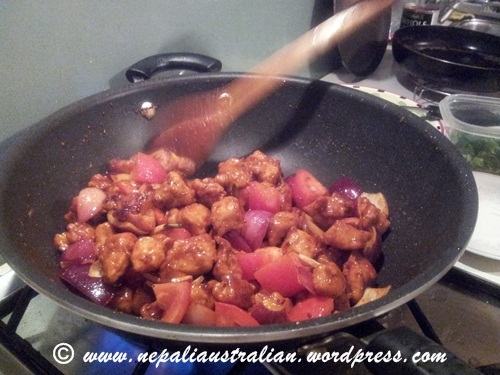 This entry was posted in Nepali food, Recipe and tagged chicken recipe, nepali chicken, nepali food, spicy chicken recipe. Bookmark the permalink. Am making this tonight to celebrate our 30th wedding anniversary. It is our favorite food and we are thrilled to see this version as the truest for ingredients and cooking process. Love and food, they go together! Thanks for sharing this with the world. You are very welcome. Happy Anniversary! Wow, I love the pic in your header! The chili looks awesome and I will have to give it a try. 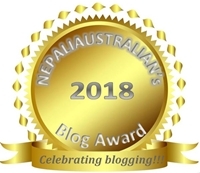 Thanks for following my blog, really appreciate it! gawd!!! i am drooling like a dawg… right now. Most excellent! I can’t wait to try this out. Looks fabulous! I love the way this looks and can imagine its scent and taste, too! Will have to check this out soon! 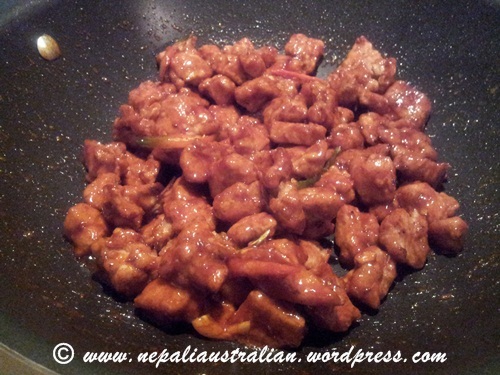 Wow, I love Nepal, and I’m definitely going to attempt this dish. Thanks. omg looking for this recepie all over….im so glad I stopped by to check it out. This is exactly what i needed to know! Thank you! Excellently posted. Great instructions & wonderful photos. I really enjoy following recipes when I know people have done them before. Wow! This looks real good! Great step by step instructions. Definitely need to get the ingredients next grocery shopping day and try this recipe! 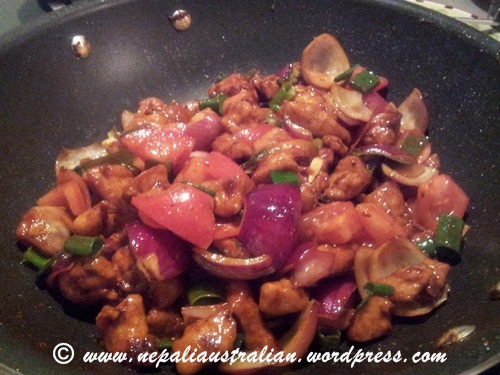 I like chicken chilli, thank you for this blog! I don’t know what some of the ingredients look like…. I hope they have them at the Asian store.